The Salerno Center for Complementary Medicine is proud to introduce the most comprehensive, pure, and highest-quality multi-vitamin formulation ever produced. Because all the vitamins, minerals, and phytonutrients have been extensively researched, you can rest easy knowing you are taking the best preventative health solution ever created. Eliminate all the uncertainty about which formula will best suit you because the Salerno Ultra Daily Essentials was designed to deliver all-encompassing support for an adult of any age, through all stages of life. 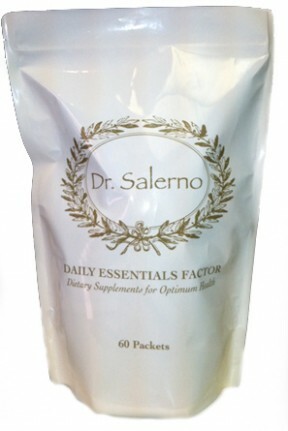 Unlock the benefits of the most time-honored, world renowned, complete multi-vitamin with Salerno Ultra Daily Essentials. Uniquely packaged using our fresh seal technology system, each piece of Salerno Ultra Daily Essentials is 100% protected from light, oxygen, and nutrient-robbing moisture. And as a result of our dedication to environmental concerns, all bag materials related to our formulas are completely recyclable. *This product contains NO yeast, soy, milk/dairy, corn, sodium, sugar, starch, artificial coloring, preservatives or flavoring. Lithium orotate is considered a mineral, just like calcium and magnesium. It has been shown to play a role in anti-aging, have beneficial effects on human behavior and is an essential nutrient for the brain. Contains 13 key neuronutrients for optimal cognitive function. The ingredients in Memory Factor were chosen for their complementary and documented roles in neuronutrition and are supported by other key neuronutrients in Dr. Salerno''s Daily Essentials Factor. Used daily, this combined spectrum of nutrients may improve absentmindedness and other mild memory problems associated with aging. and naturally ease ear pain. Solutions line of supplements for patients of all ages looking to naturally alleviate discomfort,” said Dr.
about The Salerno Center and their revolutionary Earoplane’s™, please visit www.salernocenter.com.